Named by House Beautiful as a Next Wave Designer, Kate Coughlin is known for her fresh take on traditional, creating layered and timeless spaces by incorporating antiques with new and striking a subtle balance between high style and discretion. Kate and her team combine comfort, practicality and sophistication with an avid awareness of the architectural surrounds. They work closely with clients, architects and builders, collaborating on conceptual design, selection of materials for construction and decoration, management of schedules and budgets, and execution of every detail until the project’s completion. Growing up in New Canaan, Connecticut, Kate developed a penchant for style at an early age from her mother Sky, a savvy antiques dealer and interior designer of her own right. Following a college internship at Brunschwig & Fils, Kate took a position with legendary designer Mark Hampton and later for famed decorator Bunny Williams in New York. After moving to Boston, she partnered with two designers to open the successful Design Shop in Beacon Hill. In 2003 the culmination of her experience and understanding of the industry from every angle led Kate to launch Kate Coughlin Interiors, a full-service interior design firm specializing in sophisticated, yet livable interiors. Their projects can be seen throughout the greater Boston area, as well as across the country. 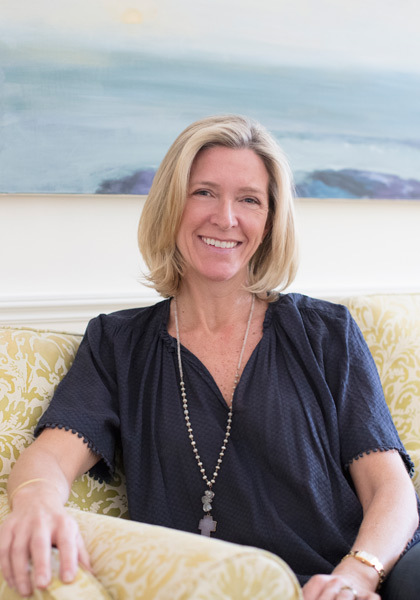 When not in the office or seeing clients, Kate can be found with her husband, three children and two Norwich Terriers at home in Dedham or savoring summer at their house on Chappaquiddick.